Does anyone at MSNBC pay their taxes? They all want to raise taxes. Guess this is why, they don't pay them. 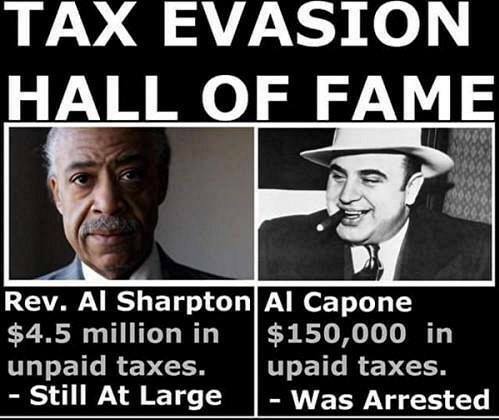 It is well documented how much Al Sharpton owes the IRS. Didn't even have to look to see who authored this one. My hunch is that those from all sides of the political spectrum are not exactly on the up and up when it comes to paying taxes. Does that in any way change the facts? FWIW I think CNN did something on this quite a while ago also. So are they being extremely hypocritical when they use the forum that 10's of people watch to push for higher taxes while not paying their own? I've said it before and I believe it now more then ever ANYONE regardless of worth or income that favors raising taxes on anyone who then by means legal or illegal does anything to reduce their own taxes is a hypocrite. No, as long the same records were reviewed the same way by several different different sources and arrived at the same conclusion. Just a hunch, but my guess is that conservative pundits cheat equally with liberal hacks. We are a nation of cheaters, you know ; lefties and righties both. We are ambidextrous cheaters. Probably a pretty lengthy list of tax cheaters even on here. I would be curious to know what your definition of a "tax cheater" is. Big difference in the righties don't push for big tax hikes on everyone else while not paying. That's the point of the post. Again, I ask, what is your definition of a "tax cheat"?